I need your advice on the latest version of embird. I was recently forced to purchase a new computer and when I downloaded embird I had to purchase the embird 2018 upgrade. I since am about to go crazy with this program. I don't know if it is windows 10 or the new embird version but it is my irritation level is beyond high. Splittling, color choice, placement, everything seems painstaking complicated and I don't know why. Everything jumps all over the place and it does not preform anything like the old version. I just remembered something else. You can test the integrity of Embird once you have installed it and it will identify any problems. Click on Test Integrity and let it run. Hey Michelle, just remembered to look for your post. 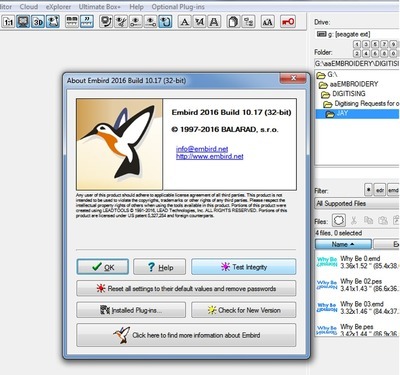 I have to say I had never had a problem with Embird until I installed it on a newer Dell laptop, running WIndows 7. I tried W10 but rolled back to 7 because I couldn't get my Xpressive to work on it. Well for the first time ever Embird actually crashes, totally without warning and usually when I've been so engrossed in the work I have forgotten to keep saving my work. I have been too lazy to look into the reason for it and I haven't bothered upgrading since 2016 Version 10-17 so maybe it is time I did. It is highly unusual that the Balaras would force you to upgrade so I do think it may have just been a glitch, one previous version is still available at https://www.embird.net/sw/embird/... if you wish to roll back. You did select the correct download for your new computer? If you have problems I definitely recommend contacting the Balara's directly, they are extremely helpful and very glad to receive feedback or notification of problems that might have been missed during testing after their upgrade. PS, I will upgrade in the next couple of days, but definitely Not going to Windows 10, yet. PS, just an afterthought, please disable ANY antivirus or anti-malware software you are using DURING the downloading process. It can and has caused problems with embroidery program downloads, in the past. Just make sure you enable it as soon as you have finished downloading Embird and Studio. Yes, these programs seem to be more and more complicated. There are two Embird Groups on Yahoo: Embird 101 and Absolutely Embird, they are extremely helpful and respond quickly. I use them all the time! I thought that you could download your old version of Embird from their site, but I might be wrong. So, check that option out too. Same happens to me - I don't mind the fee for upgrading but I still have Windows8.2 on the computer I am using for embroidery so I say No as well. I wonder what the extra's are and hope s.o. has upgraded. I did not upgrade 6D either - because of the $799 upgrade fee. I never use all the features anyway as I do a lot of digitising in Embird and rather spend that amount of money on s.t. else. If it opens again, check the box next to "don't show this message again" - save a lot of irritation, at least it did for me. P.S. I hope Meganne sees this post, she has Embird. Michelle, I opened my Embird to use it but got a message that I HAD to upgrade to the latest version and my program just shut down... so I have to upgrade if I want to or not!! You may not be able to go back to the older version!!! I don't think this is fare, we are now forced to upgrade or don't use the program. I wonder why that happened, mine works just fine. Did you try uninstalling and re-installing . Is your computer 64 bit? Did you download the 64 bit version and not the 32 bit? Probably a good idea to re-download before re-installing in case your download was corrupted.